This was a cracking championship style game in a well appointed and stewarded Skyrne pitch on Thursday evening in drizzly conditions. Both teams gave it their best in this thrilling encounter right to the end of the 73 rd minute. Curraha started slickly and pointed after 3 minutes. Bective responded with a point and Curraha added 2 more. Bective's Paul Mc Cabe pointed 2 frees after fouls on Cathal McConnell. Curraha tagged on a point and then in the twentieth minute Sean Keating engineered a great solo goal from a long high ball in by muscling past two defenders and chipping over the keeper. McConnell then weaved his way through the defence but had his left foot shot for goal was saved by the Curraha keeper. Keating with a "man of the match" display won exceptionally difficult possession and added another 2 points. Stirling work from Bective's defence limited a hard running Curraha attack to another point and Bective went in at the break 1-5 to 0-5 in front. Both teams started the second half with the same determination and fought tooth and nail for every possession. Curraha showed plenty of enterprise and were more productive early on and gained parity with 3 points after about 10 minutes of play. Bective replied with a point from Paul Lyness but Curraha then struck for their goal. Bective lost Cathal McConnell at this time to injury and he was replaced by the experienced Brian Cantwell. 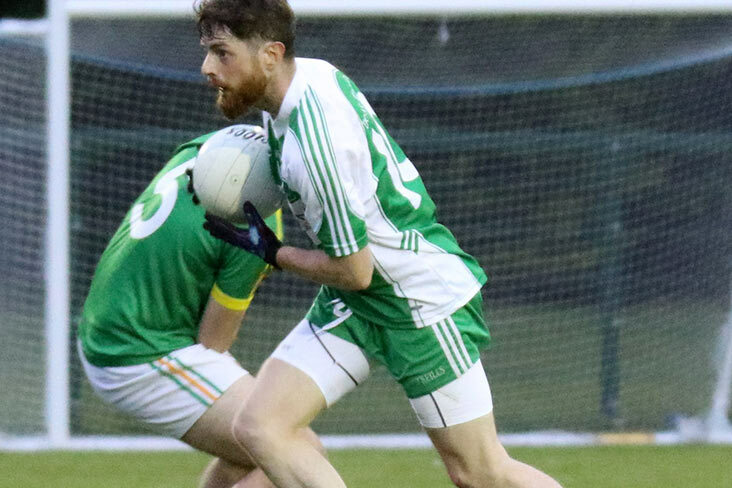 Neither team was prepared to concede advantage and Bective freshened up the team by introducing Ronan Murtagh to midfield, Craig Roche in defence, and Kevin Brennan in attack. This added a new resolve and resulted in good points from Paul Lyness, Sean Keating, Marty Mulhall, Brian Cantwell and the hard working James Davis. Bective were ahead by a point with 3 minutes left but were under pressure from Curraha, playing without the injured James Mc Entee, and they scored a deserved equaliser. Both teams gave it their all to work a score in the final minutes, much to the excitement of the supporters, but the teams were still level when the final whistle blew 3 minutes into injury time at 1-11 each. Nothing could separate these Intermediate rivals at Skyrne on Thursday night when both teams served up a treat of mid-week football. A Conor Moriarty point opened the scoring on the 3rd minute but this was cancelled out with a Bective free. A well taken point from David Toner had Curraha back in front and there was no score for ten minutes then as both teams had missed opportunities. A mix up in the Curraha defence saw Sean Keating get on the end of a high ball and he calmly chipped the oncoming Liam Hogan to raise the green flag. David Coyle got his sides third point before Bective added two of their own. Toner added his second of the game before Moriarty added a 45 to cancel out another free from Bective. Curraha came out all guns blazing in the second half and had reduced the three-point deficit inside the opening ten minutes. A fantastic goal from Moriarty on the 43rd minute had Curraha in full control but let Bective back into the game as they rattled off four unanswered points to go one ahead. Substitute Sean Keogh kicked a great score off his left to level matters with ten minutes remaining. Bective raced into a two-point lead soon after though but a wonderful score from Brian Murphy had it back to the minimum. A Moriarty free had the teams level for the final time and despite a late surge from Curraha they couldn't get the winner and will rue some missed opportunities throughout the game. Curraha: L. Hogan, S. Hogan, N. Murphy, M. Phelan, M. Jackson, N. Shortall, S. O'Hanrahan, B. Joyce, B. Murphy 0-1, G. Coyle, P. Dowling, A. Battersby, D. Coyle 0-1, D. Toner 0-3, C. Moriarty 1-5. Subs: S. Keogh 0-1 for D. Coyle, A. Coyle for G. Coyle.